The popular video hosting and streaming website YouTube uses two technologies to stream videos to its users. Either by making use of Adobe Flash, or HTML5 Video, with the latter option marked as experimental for some time now. Provided that you have a HTML5 capable browser, you can join the HTML5 trial on YouTube to use this technology on the site. The core benefit here is that you do not have to install or use Adobe Flash Player at all. To do so, load this page on YouTube http://www.youtube.com/html5 and click on the join button on it. If you have not visited that page for a while, you may notice that Google has added three new bits of information to it. The page not only informs you if your browser supports HTML5 Video, H.264 and WebM VP8, but also if it supports Media Source Extensions. If you open that page in Firefox, Safari or older browser versions, then you will notice that the browser's don't support it. A highly technical draft document is available here that provides you with additional information about Media Source Extensions. 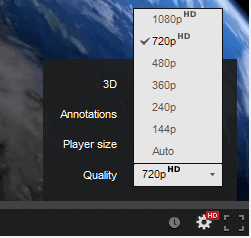 If you are using the HTML5 video player on YouTube in Firefox, you may have noticed that you do not get to select 1080p or 480p as the video resolution no matter what you do. You may have also noticed that you do get to select 1080p if you leave the HTML5 beta and return to Adobe Flash Player. Google recently switched to adaptive streaming on YouTube for 480p and 1080p videos by using Media Source Extensions. Since Firefox does not support that feature yet, the option to switch to streams that make use of it becomes unavailable in the browser. That's why you cannot select 1080p or 480p anymore if you are using Firefox and have joined the HTML5 video trial. The only way around this for now is to use Adobe Flash to play videos on YouTube. Mozilla is working on an implementation of Media Source Extensions, but it is not clear yet when it will become available. You can follow these two bugs on Bugzilla to monitor the progress made in this regard. Thanks! I noticed this but didn’t know it was because of this change. The problem with Dash playback of videos, at least the way it is implemented at YouTube, is the limited period of pre-loading it allows. My slower internet connection doesn’t allow for 1080p real-time streaming, so I always need to rely on a certain amount of pre-loaded video and the Dash pre-loaded is much too short for that! This means, that I can’t watch a full-HD video anymore without pausing to allow for incremental pre-loads several times (!) per video. Because that is absurd, I’ve taken to download 1080p videos from YT with the ‘Free VideoTube Downloader’ from Chris PC, because it’s one of the few applications that can download Dash videos. Watching them afterwards in MPC-HC is much more comfortable anyway. YouTube has been pretty much unusable for a couple years here, then disabling Dash Playback with YouTube Center seemed to do the trick; now YouTube is screwing that up too, as in, videos sometimes do not play at all with Dash disabled, they don’t load even a single second, no error message, nothing. This update sadly also broke all free “Youtube downloader’s” out there for full-hd video, luckily this cross-platform, cross-browser addon – Your Video File is updated to work but I dont think this should be the case in near future seeing the amount of efforts Youtube is pouring to stop them. Google is constantly engaging in anti-competitive behaviour like this. It’s encouraging me to use other services more, when I can, but it makes users John and Jane switch to chrome. Chrome is the new IE6. Honestly i tried it only after reading your article. 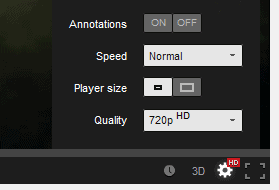 yeah you are right HTML5 player does not support 1080p and 480p videos. One thing i want to ask here, is it the reason that why most of the firefox plugins to download you tube videos, or mp3 are crashed / not working these days. The non-Dash method – now only available for 720p/360p resolutions – was/is simply a one-file download in the formats MP4/Webm/flv. With Dash playback however the player will receive the video and audio parts separately. That’s not a big problem for the streaming in the browser, but most applications/add-ons/plugins that provide a Youtube download service don’t support this (yet). It will take time for developers to update their software to the Dash method, but for some methods this won’t be possible (for example userscripts like ‘Youtube Center’). I’ve mentioned the Chris PC software ‘Free VideoTube Downloader’ in my earlier post, because it’s one of the few that already works with the 1080p resolution. DASH, one of the worst features to be made available on the consumer’s end. Not only is it slow due to the way the system works but also because Youtube servers don’t really tend to always use all the available bandwidth, negating the perfectly usable non-DASH streaming that after the content was fully buffered, there would be instant seeking. Thanks so much for mentioning the Firefox add on You Tube Center, which I was unaware of. I installed it and immediately several problems that had been vexing me for some time were fixed. It made my evening! Thanks for another great and informative article. I hope they will add support for that “Media Source Extensions” feature ASAP. Though your remark would be non-technical, consider going on the Bugzilla thread linked in the article and telling them to stop taking their sweet time with this (also with WebP…). Bug threads related to this component on Mozilla date back years. A couple things to add to what the article mentioned, most of us may agree that switching to HTML5 is a good thing and all video-providing services being able to stream both without having to buy an Adobe suite when Adobe is migrating to HTML5 themselves along with many other people) and without wasting an enormous amount of bandwidth (it’s common for people to pull up a video and stop watching it even though most or all of the remaining video has been transferred, just like how many websites you visit lazyload images, meaning images don’t download until your browser, as you scroll down, is about to scroll over them into visibility, downloading just in time) and saving bandwidth without too much collateral damage is good for everyone. Also, one alternative to being able to watch 1080p youtube still and without using Flash is to use a browser that does support this adaptive streaming on HTML5 — for example, Chrome, or Chromium if you dislike Google (and like open source), probably Maxthon and Opera I’d guess. Chrome comes with Flash but you can disable it by going to chrome://plugins. To those of you looking to get around this blockade by installing some greasemonkey script (that probably wouldn’t work) from userscripts, I’d encourage you not to as so many of those are malicious, it’s extraordinary. There’s an error. It’s HTML, not HMTL. It’s mozilla that’s failing this time. When MSE was introduced into youtube IE was supporting it for months, Chrome around a year. Yet mozilla even a year after isn’t finished implementing it for firefox… So something like a two year handicap. I’m having the same issue on Chrome, strangely enough. This bug has been filed at Bugzilla for over 2 years now and they still haven’t fixed it. What are the FF devs playing at? One would think that their browser lacking a feature that stops its users from being able to watch watch 480p and 1080p video on the most popular video sharing website in the world would be a very important issue to them and one they’d fix with the utmost haste, but it’s starting to feel like they don’t even care. Even frigging IE has support for this. What on Earth are they doing at Mozilla HQ? Its almost done actually. Its going to take a few releases to filter down to normal users though. They may uplift to a sooner build but that’s a shot in the dark. If by almost done you mean you can’t view a single video without hanging, freezing, if you seek then it is.